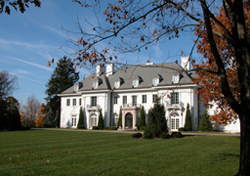 Oldfields is located in a small corner of Indianapolis that was a highly exclusive enclave of wealthy estates in the early 1900s and is the only intact holding left in the development. The estate is one of the best surviving examples of a Country Place Era estate in the United States. 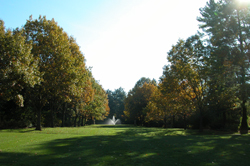 Its highly significant landscape was designed by the nationally recognized Olmsted Brothers firm. Oldfields was home to some of the most influential business leaders in the city including the Lilly family, operators of the international Eli Lilly pharmaceutical company. In 1909, Hugh and Suzette Landon bought the large tract of farmland here and hired Lewis Ketcham Davis, Mrs. Landon’s brother, as architect for the main house. Landon was president of the Indianapolis Water Company. The Landons were concerned about fire safety, and Davis assuaged them by coming up with a reinforced concrete-frame, hollow-tile house veneered in brick. Hugh, Suzette, and their three daughters moved in upon its completion in 1913. The house was grand but lacked any distinctive setting. Suzette Landon died in 1918, and in 1920, Hugh married Jesse Spaulding of Chicago. The two found the ideal environment for their mansion when visiting the Lamont estate in North Haven, Maine, which had been designed by Percival Gallagher of Olmsted Brothers, the second generation of the firm founded by renowned landscape architect Frederick Law Olmsted, Sr. After seeing his work, Jesse wrote to Gallagher requesting his services at the family’s rural Indianapolis home. Between 1920 and 1925, Gallagher designed and created a landscape that survives incredibly intact today. Six principal spacial components were in Gallagher’s plan—entry sequence, grand allee with a tree-lined vista, border gardens, ravine garden, formal garden, and hillside ramble. Secondary spaces included an orchard, cutting garden and greenhouse area, service area, and pasture. Gallagher’s original intent is evident in the many original drawings found for the project. Tragedy struck the Landon household again in 1930 when Jesse died. Hugh sold his estate to Josiah Kirby Lilly, Jr. J. K. Lilly and his wife Ruth would stay for many years, but not until he had hired local architect Frederick Wallick to alter the interior and exterior of the house. One of the additions was a portico added to the main front. The landscape remained much as Gallagher intended. J. K. was the son of Eli Lilly, founder of the well-known pharmaceutical company. He oversaw a period of great expansion and innovation at Eli Lilly & Company, one that transformed the firm into an international company, and served both as its president and chairman of the board of directors. He also excelled as a collector, philanthropist, and humanitarian. In the early 1970s, the Indianapolis Museum of Art moved from its founding site at Herron Institute of Art to this location. The modern museum building is situated immediately adjacent to the Landon/Lilly Estate. Oldfields is part of IMA’s museum experience, where visitors get a glimpse into a now-lost way of life. The museum has fully restored the rugged ravine garden with its manmade water run lined by glacial boulders, using originally specified plant materials where needed. Main components of the Gallagher plan – the estate wall, entrance gate, estate drives, formal garden, ravine garden, allee, border gardens, hillside rambles, orchard, and greenhouse – remain for visitors to enjoy and experience a Country Era estate. Oldfields, a National Historic Landmark, is located on the northwest side at 1200 W. 38th St. Click here for the National Historic Landmark registration file. Oldfields is on the grounds of Indianapolis Museum of Art. Grounds and museum are open Tuesday through Sunday, 10:00 am to 5:00 pm; Thursday, 10:00 am to 9:00 pm. Closed Mondays, Thanksgiving, Christmas and New Year's days. Admission charged. Grounds open free of charge dawn-dusk. Contact 317-923-1331 or Indianapolis Museum of Art for more information. The ravine garden is at its height in spring. While visiting this landmark, tour the world-class galleries in the main art museum building. One highlight is the impressive collection of Hoosier School art. INDYGO bus line from downtown: #34 Michigan Rd. ; disembark at 38th Street; museum is across Michigan Rd.